How do you feel about Brussels Sprouts? It seems like they are the darling vegetable this year – I’m seeing them all over Pinterest and on pretty much every healthy food blog I read. But for everyone loves them so much, I really think just as many people hate them. I’m going to guess that most of the haters grew up having to eat them, all boiled and mushy and let’s be honest – they can kind of smell when they’re prepared that way. What the haters don’t know is that if you roast Brussels sprouts, they become crispy, crunch and caramelized, and almost a bit sweet. I love to roast them this time of the year, often with some squash, and cranberries. But really, I think Brussels Sprouts taste just as yummy raw. No, you can’t just pop them – they’re too tough and leafy. 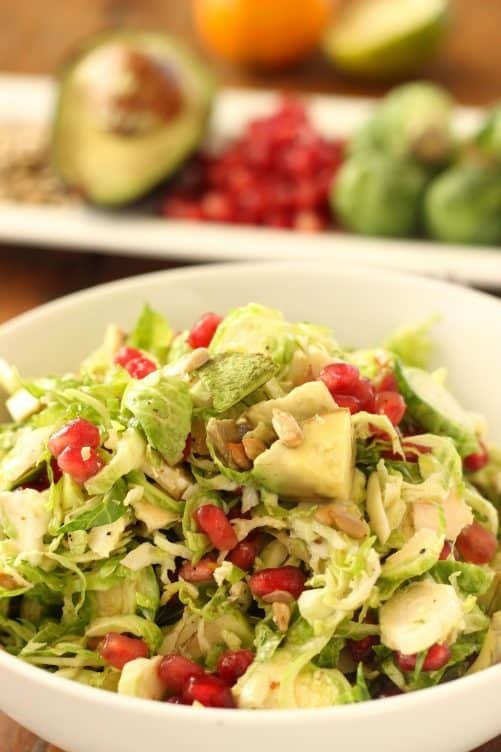 But if you shave them, really thin, and toss them with a mustard-y dressing and some other mix-ins, you get a delicious and super healthy slaw, that’s great as a side dish, or as a topping on a sandwich, or just as a nice change from salad. Brussels sprouts are a cruciferous vegetable – the kind that have actually been shown to help prevent cancer. So eat up! Other cruciferous veggies include kale, broccoli, cauliflower, and even bok choy. Eating a serving of any of these a few times each week can do lots to keep you healthy. To shave Brussels sprouts, use a sharp knife to slice them thinly, or much easier – pop them into a food processor fitted with the shredding blade. Easy peasy! Shred Brussels sprouts in a food processor fitted with the slicing blade, or alternately, slice them very thinly with a sharp knife. Toss them in a large mixing bowl. Add pomegranate seeds and sunflower seeds to the bowl. Prepare dressing. In a small measuring cup, mix together juices, vinegar, olive oil, and mustard. Whisk well to combine and add salt and fresh ground pepper to taste. Pour dressing over the salad and toss well to coat. Add avocado immediately before serving. Thanks Dahn! Let me know how you like them! This sounds so good! I love brussel sprouts and never understand when people tell me they don’t like them. I know, right – what’s not to love! Thanks for stopping by Genevieve! Love this recipe! Would be so beautiful on my Christmas table! 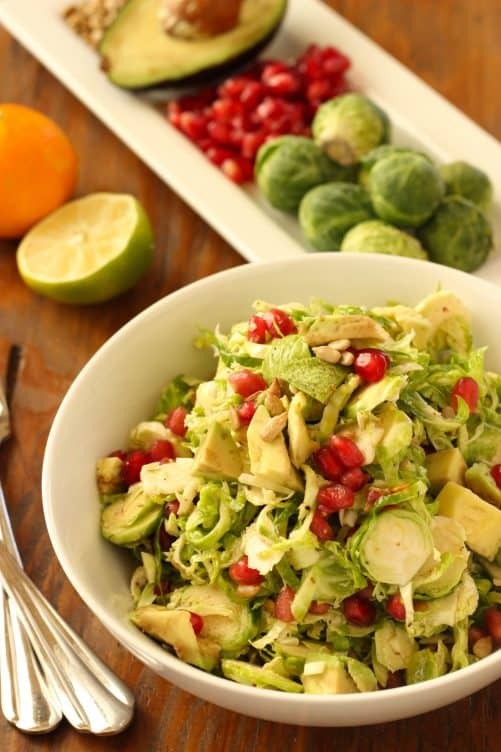 I posted a brussel sprout recipe today too.. love those little guys! I haven’t tried slicing them yet – I normally just roast them! And avocado makes everything better! I love this recipe, looks delicious! Do you soak the brussels before shaving them? I normally soak mine if I have the time before roasting, but wasn’t sure if you needed to with this recipe! Thanks! Hi Anna – I’ve never heard about soaking them, so no, I just wash, peel any bruised outer leaves, and trim off the tough part of the bottom. Enjoy and Thanks for visiting! 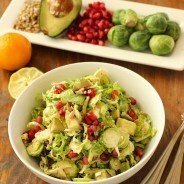 I have been seeing Brussel sprout salads popping up everywhere! I see a new trend coming on… Looks so delicious, I want! I know! I think they’re the new kale!